Somehow I had a big gap between listening to the wonderful first two books in this series and this third one which released a year ago. I highly recommend the entire series! I think I had a lot of life stuff going on and major health issues that got in the way. Then I was off to Mackinac Island for the summer and got the chance to regroup. So I've been catching up on my audiobook listens! The narrator, Amy Bentley, really enhances the story! I give her 5 Stars for her narration! Hit it perfectly! A narrator can help your story or spoil it and Ms. Bentley was wonderful. I loved this story as I did the other two in this series. Liz Johnson has this great author's voice. Having met her in person and been in a collection with her (A Cup of Christmas Cheer, Guideposts Books, now out of print) I wasn't surprised I'd love her voice as she's such a sweet lady. Her characters are so relatable and down-to-earth. And I enjoyed the three very different stories. That really showed her talent in having same story world but completely different story plots. In the novel, Natalie has been basically pressured into returning to Prince Edward Island, by her fiancé Russell a wealthy and prominent music producer. Little did he know!!! This isn't where she wants to be. At all! But Natalie has some healing that can come from this return. Ms. Johnson does a great job of developing the characters and especially with arcs for both the hero and Justin and Natalie's fiancé. I loved that she didn't resort to using some typical things with Russell but had a deft hand in showing us his nature. I used an Audible.com download for my listen as I have a membership. Delightful romance! Grab all three listens! Fifteen years after she left Prince Edward Island, Natalie O'Ryan had no plans to return. But when her fiancé, music producer Russell Jacobs, books their wedding in her hometown and schedules a summer at Rose's Red Door Inn, she sets out to put the finishing touches on the perfect wedding. But she can't possibly prepare for a run-in with Justin Kane - the best friend she left behind all those years ago after promising to stay. Justin's never forgotten Natalie or the music career he always dreamed of pursuing. He'd been prepared to follow her off the island until his dad died and he was left to run the family dairy farm. He's done the best he can with the life that was thrust upon him - but with Natalie back in the picture, he begins to realize just how much joy he's been missing. After Natalie's reception venue falls through, she must scramble to find an alternative, and the only option seems to be a barn on Justin's property. As they work together to get the dilapidated building ready for the party, Natalie and Justin discover the groundwork for forgiveness - and that there may be more than an old friendship between them. Giveaway: Box of Christian fiction books to one commenter. Melanie congrats! You are my winner of a box of CF books! Blessings! I have the Red Door Inn but have not had time to read it yet. Good thing to know there are more in this series. This one sounds good as well. I loved this series. Glad you enjoyed it also. Oh this sounds like a good one!! I must catch up with the whole series. 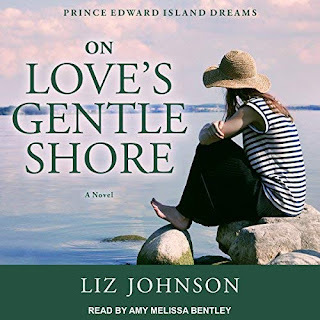 I read all three books in this Prince Edward Island Dreams series. They are all very good with memorable characters. I've only read the first in the series. I think I may have to listen to this and the second one. Thanks for the review Carrie! Wonderful review, Carrie! I've been wanting to read this series. I read the entire series back to back to back just earlier this fall, loved it! I am a new reader of Liz Johnson. I am putting her books on my tbr. I am currently reading A Sparkle of Silver.